You’ve adored her growing baby bump for months now. You had a blast at her baby shower, and you’ve bemoaned her swollen ankles with her. And finally, that perfect bundle of joy is here! 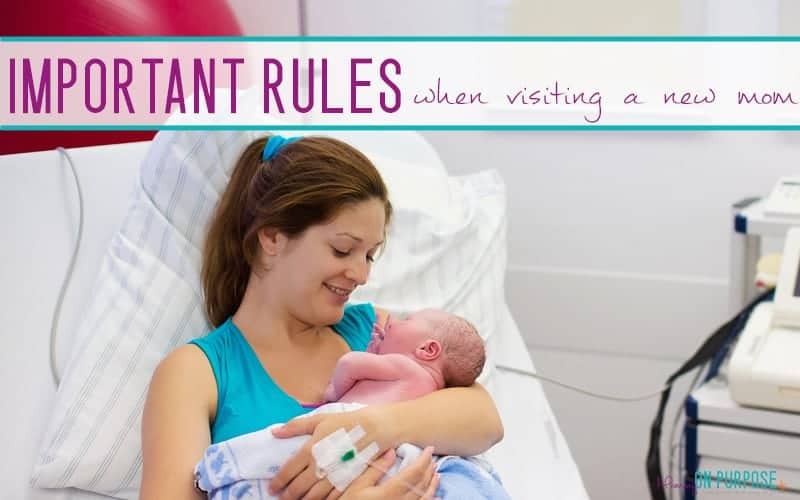 But wait…before you rush off to meet the little baby, read this list of rules for visiting a new mom. These are the things many new moms (or repeat moms with a new baby) won’t say but wish you knew. Don’t be the person that shows up to “surprise” her friend, okay? Just don’t. Having a baby is hard work. It exhausting, grueling, scary – and the reward is that perfect little one with that darling baby smell. She’s having her baby-moon and may not want to share it with you or anyone else. She’s more likely googling ‘how to pee postpartum‘ than she is thinking about being presentable for guests, so be understanding if you have to wait a few days or even a few weeks to meet this little one. This is one of the rules for visiting a new mom that is most often over-looked, but most appreciated by the new mom when it’s respected. I once told a friend they couldn’t come over yet (and they were such a good friend, they totally understood!). And I have another friend who doesn’t even tell people she’s given birth for about a week because she just doesn’t want the company and doesn’t want to feel bad saying ‘no’! If you’ve received word of baby’s arrival, check before assuming they want company. If you’re looking for something more lavish, consider an Instant Pot (if she doesn’t already have one). These are amazing things for new moms, and make life so much easier at meal times. If you need more ideas, check out this GIFT GUIDE I put together for new babies. Here’s another one that might be helpful, too. And don’t forget the siblings. A “newly promoted” big brother or sister would enjoy a gift way more than the newborn who doesn’t want anything other than his mama’s love right now. A stuffed animal, a deck of Uno cards, a new movie, or some glow-sticks from the dollar store will go a long way with a brother or sister to helping make this time more special for them. Meals are always a winner. Bring something they’ll all enjoy, and bring it in a disposable pan so no one has to wash it and return it. Want to score some major brownie points? Bring disposable plates, napkins, and utensils, too so that they don’t have to do dishes with your meal or any others that week. This might almost need to move to first place on the list of rules for visiting a new mom, because after delivering a baby, she’s not up to making big meals for her family. No new mom wants to feel bad about having you come in and clean her home. But if you some laundry waiting to be folded, sit and chat and fold it. Or load the dishwasher. Or wash dishes by hand. Offer to run the vacuum (she might say no if the baby is asleep). Consider cleaning the bathroom…tell her it’s part of your gift to her! In fact, consider letting her know it’s part of your baby gift so you can plan the day/time you visit to spend a good hour on housework while she puts up her feet and enjoys bonding with her new baby. You may even want to call from the market before you head over and ask what they need. She might need ibuprofen, baby wipes, or even have a lingering pregnancy craving you can help her indulge. Both mama and newborn need a nice quiet, safe environment right now. And a healthy one! If you, your significant other, or your kids have been sick lately or seem like you might be heading that way, stay home. I know it’s hard, and you’re tempted by those squishy legs, cute little fingers, and that irresistible baby smell but it’s not about you right now. It’s all about what is best for them. A little sniffle to you can turn into a hospital stay for a newborn in extreme cases, and it’s just not worth the risk. You can still leave a meal at the door, though, or drop off a gift for momma! This postpartum time is actually incredibly important for both mama and baby for bonding, healing, nursing, and more. They may not want to be separated. If mom is willing to share her treasure, she’ll let you know. I know it’s hard; I mean, who doesn’t want to get their hands on a darling new baby and inhale that absolutely amazing new baby scent? But God made that smell just for mamas, and if she wants to keep that baby close you’re being a good friend by supporting that choice and not making her feel bad about it. On the flip side, she might offer to let you hold the baby. And if she mentions she’s dying for a shower, offer to let her take one while you get those snuggles in. Let the new mama tell you what she needs. Moms have a lot of hormones swimming around their bodies after having a baby. They may want to tell you the story of labor and delivery. They may burst into tears or laugh, depending on how they feel. They may need a hug, or they might need some space. There’s no hard and fast rule here, so you’ll have to take your cues from her. But love her well. She might be leaning toward some postpartum blues or even depression, so be gentle and supportive. When you’re next friend is expecting a baby, be the courteous friend that follows the rules for visiting a new mom. She’ll remember how great you were! NextIs blogging still profitable in 2019? This is awesome! We should post this on all new moms’ hospital doors for visitors to read before entering.